It’s twenty years from now, and I’m in my mid-80’s. My granddaughter, Colette, now 24, is considering starting her own consulting practice. That might be rather young to become an independent professional, you’d think, but she’s brilliant, a quick learner and bilingual. She graduated from university with honors and excelled in the field of cross-cultural communication. I smiled broadly, wondering how I can condense the most important learnings about marketing I’ve absorbed over the past fifty years. 1. 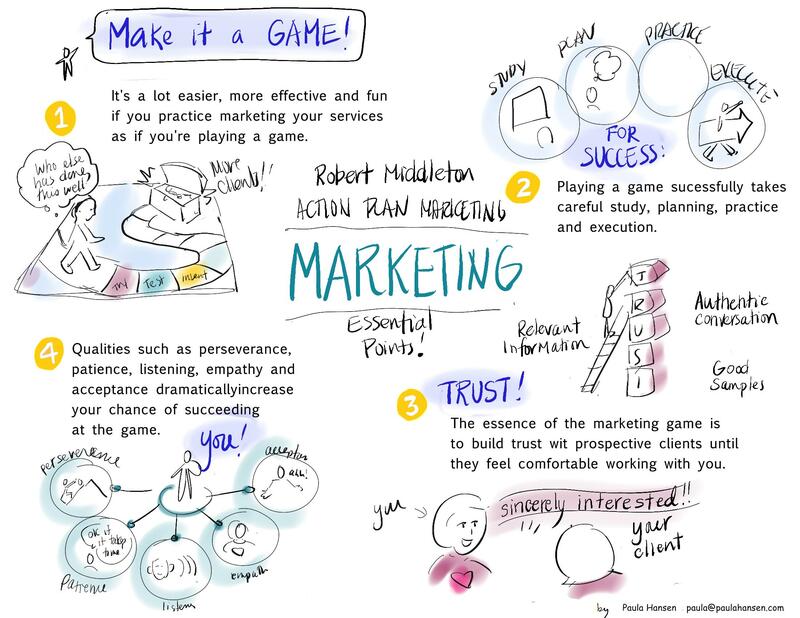 It’s a lot easier, more effective and fun if you practice marketing your services as if you’re playing a game. A game is where you make one thing more important than any other thing and put your focus solely on that. The game is to simply discover how to get that one thing (new clients) with the least amount of time and effort. You don’t think of getting what you want as a problem, a dire predicament or tiresome slog. You think of it as a challenging exploration. You try things, test things, add things and subtract things until you find strategies and tactics that work consistently. 2. Playing a game successfully takes careful study, planning, practice, and execution. I’ve given clients, in similar situations, very detailed information for implementing a marketing strategy. Some succeed wildly; others barely got started. What do the successful ones do? Those who succeed study the strategy closely and often examine additional information. Then they spend some time planning exactly how and when they will do it. They practice the strategy (a marketing message, phone call or presentation) until they feel comfortable with it. Finally, they roll it out and fine tune the strategy until it gets consistent results. Sound complicated? Well, it can be a fair amount of work, but this is what all successful professionals do. They don’t wing it. They work at getting very good at it. 3. The essence of the marketing game is to build trust with prospective clients until they feel comfortable working with you. What few people realize is that, in many cases, trust can be established almost immediately. You can achieve this with an authentic connection, relevant information, a good testimonial, or a sample of what you can do. When trust is established, your goal is to increase trust by asking a prospective client to take the next step towards working with you. You might ask for a conversation, to attend a presentation (talk, webinar, etc), or a watch a video. But you must ask without manipulation or coercion. Ultimately, trust is built when you show sincere interest in someone. If you don’t care about people and just want to sell them your services, they will meet your efforts with indifference or resistance. 4. Qualities such as perseverance, patience, listening, empathy and acceptance dramatically increase your chance of succeeding at the game. When I’m speaking to a prospective client, I’m not worried if they don’t understand principles one through three yet; those can all be learned. But without these key qualities, people will find it very hard to become proficient at marketing. Those who don’t persevere, give up too easily. Those who are impatient get frustrated, even angry. Those who don’t listen will not learn what needs to be learned. Those who have little empathy will find it hard to build trust. And those who find it hard to accept things as they are will become complainers and victims. Building these qualities takes the maturity that experience brings. Of course, few people are masters of these qualities. But they must be committed to practicing them. If they don’t, success at marketing is going to be extraordinarily difficult. I go through these points slowly and carefully with Colette as she listens with rapt attention, taking notes. I reach into my bag and handed this article to her. And I also give her a copy of my book, Marketing Ball, that I had published almost 30 years ago. Here’s a quick graphic of today’s ezine/blog from Paula Hansen of Chart Magic. Check out her website and services. previous post: Hate Disapproval? Join the Club! next post: Marketing Yourself in the NOW!